The biggest challenge organizations face is keeping real time track of the details and the status of the day-to-day operational tasks assigned to those they manage. Managers waste massive amounts of time and productivity figuring out the status of events and projects they supervise via email dialogues, telephone inquires, and status meetings. Most organizations have some type of centralized software system meant to assist with recording, scheduling, sharing, and monitoring their business operations. These are normally either off-the-shelf products built for their specific industry, or customized systems. However, in lieu of these software systems, the vast majority end-up using spreadsheets, emails, calendars such as Outlook and paper and pen to keep real time track of the status of their day-to-day operations. Project management software packages have proven cumbersome and incomplete for managing business operations. 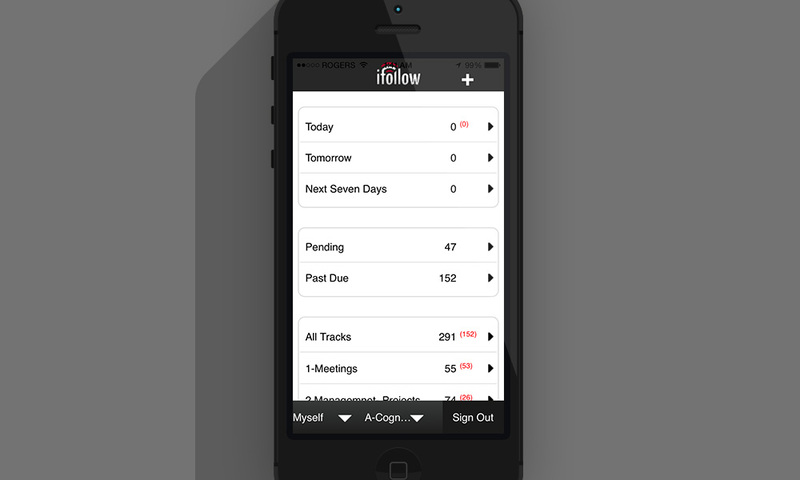 iFollow is a powerful yet simple to use software system for managing business operations. The main product is an enterprise level system that allows managers to assign and track business operations in real-time. The revolutionary timeline based dashboard allows managers to comprehensively view the real-time status for company-wide assignments in a single glance, which is unthinkable in conventional solutions. iFollow is a platform that provides a dynamic, color-coded timeline based dashboard that allows managers of any sized organization to view the real time status of their day-to-day operations at a single glance. iFollow is organized along topical tracks that are defined by the user. The filter system allows a manager to drill down based on a specific topic, employee or internal work group, customer or event status. The system is highly customizable by the user. iFollow users can create their own custom status terms that will appear in the system’s drop-down menu as status choices for an event. They can create custom forms for data capture. Users also have the ability to link a sequence of events and save the custom sequence in the system so it can be assigned in the future in a single click. Implementation is extremely easy because employees can begin using iFollow without any training. Employees with tasks assigned can receive task notification alerts and reminders via email. Also, users can update the task status and enter notes by simply replying to the notification email they received.